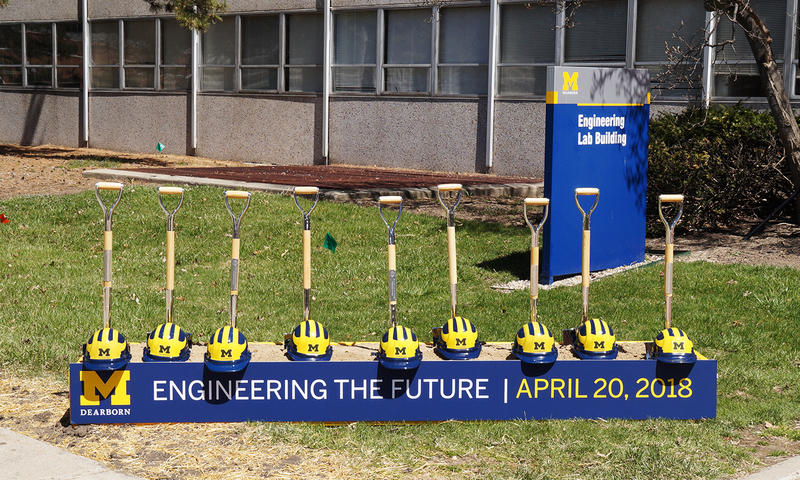 With its Engineering Lab Building (ELB) replacement project, the University of Michigan Dearborn is aiming to provide space for innovative, modern academic programs designed to train and educate the 21st century engineer. The university recently celebrated the official start of the project with a groundbreaking ceremony on campus. This 123,000 square-foot signature teaching and research laboratory building is designed to attract and retain the best and brightest faculty and students in high-demand and emerging fields. Granger Construction is serving as Construction Manager for the new $90 million, three-story ELB project, which will expand the building by 33,000 square feet. When completed, the ELB project will feature 6 general classrooms, 40 teaching and research labs – including cybersecurity, human factors, bioengineering, robotics and new materials – and 24 faculty offices. Additional classroom and lab space is a critical need because of an expanded and ever-changing curriculum and years of enrollment growth. Modern, flexible classrooms will allow for a variety of different room layouts by simply rearranging seats and tables and moving retractable walls to better accommodate demand, something not possible with the existing static classrooms and lecture halls. Dedicated labs that replicate industry environments will provide students excellent opportunities for research with faculty, training and career preparation. Labs will be equipped with centralized gases and water supplies for research and experiments and clean rooms for sophisticated materials preparation. Additional labs will also accommodate newly added programs and additional faculty research opportunities in mechanical and electrical technologies, mechatronics, robotics and other emerging fields. The new ELB, slated for completion in the summer of 2020, will also allow UM-Dearborn to double its number of engineering graduates and continue to be a premier pipeline of talent to Southeastern Michigan and beyond. View a virtual tour of U-M Dearborn’s new ELB below!